We arrived home from Yellowstone really late Friday evening, and found a sweet box waiting for us! 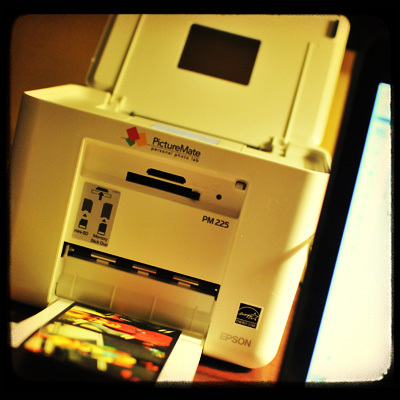 The Epson Picturemate Charm 4x6 printer has arrived, and I can start printing photos. I say CAN START, because I didn’t even get as far as opening the box until this evening. I woke up on Saturday morning with a huge headache - the kind that is massive and on one side of the head, and doesn’t respond to anything but a big dose of meds and some hours of sleep. I was able to make it through the family pictures we had scheduled for yesterday morning, and then sent my sweet ones to a water park in Rexburg while I crashed out and tried to sleep off the pain. THREE doses of Ibuprofen & Excedrin Migraine later, the headache finally subsided, around 7 p.m. Ugh. I am assuming it’s from the weird sleep, the altitude, the travel, the sleeping on an airbed, or the staying up WAY too late talking with Jason & Jessica - or all of these - that contributed. And I just get them now and then anyway, with no warning. Played games with my family and visited, and then this morning we all went to church together. So it was really this afternoon that I got to crack in to the blue box and see what the 4x6 print world is all about. First off, the PictureMate is SO CUTE. It is like a miniature cooler, complete with a carrying handle. And the instructions call it PictureMate, like that was its name. As in, “do not use plain paper, or you will damage PictureMate”. I decided that instead of PictureMate, I will call him Sven. I will not use plain paper, so as not to damage Sven. Hello, Sven. Welcome to my scrappy life. :) You and I will make beautiful pages together. You can plug the printer in to your computer with a USB cable (which you have to scavenge from another place because it isn’t included), install the printer driver with the included CD, and use Photoshop to edit and print the pics. I know I said two, but there is a third way - and that is with the battery. So you can literally take your Sven to the park and scrapbook there. Neat? Heck yeah! First thing I noticed is that Sven is screaming fast. Like, a 4x6 in 15 seconds from the time I hit Print in Photoshop. So that is awesome. Just snap the ink cartridge in to the back, put in some photo paper, and hit Print. Oh, and how are the prints themselves? Classic Epson quality - meaning that they are the best looking prints out there. WAY better than lab quality. I have the glossy paper, and it was dry in about 10 seconds, beautiful enough to frame. You can see the size of the prints there in the center of the table - I have one 4x6 and two 3x3s that I had already cut out. My album is there on the left side. So in addition to the lesson I learned about getting all my album backgrounds in before we leave on the trip, I discovered another lesson: it is indeed WAY easier to get a process going with consistently sized photos. I am really loving the 3x3 size, and they fit really nicely into both my 7x10 album and the kids’ 5x7 albums. Okay, the Yellowstone pictures are up tomorrow or Tuesday (or Wednesday, since we spend Tuesday driving to Oregon), but I just had to post the PictureMate update. I MAY even be able to finagle giving one of these lovelies away. Stay tuned for news on that!